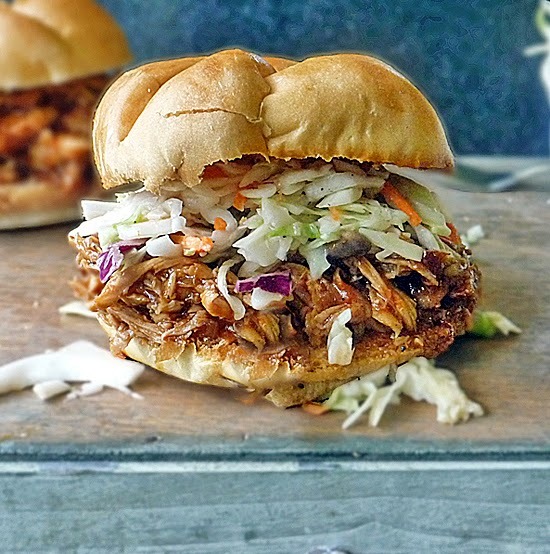 Barbecue Pulled Chicken Sandwich is loaded with sweet, tangy barbecue flavor and lots of garlic to make the best pulled chicken sandwich I've ever had! This recipe is perfect! 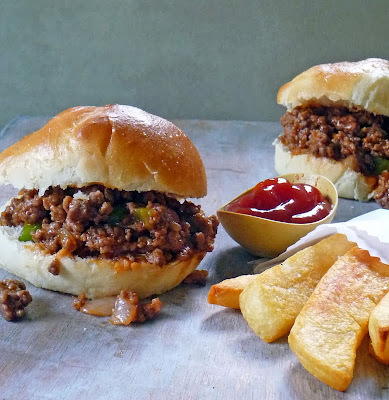 It is mouthfuls of tangy sweet happiness, and you can cook this indoors in the a/c! This is important when you live in FL and it is 9 million degrees outside!! Okay, I exaggerate, just a little! It's hot out there folks and don't get me started on the humidity! I love living in Florida, it is paradise much of the time, but I tend to hibernate from about June until October! If you are like me and don't want to stand in front of a fire on the 4th of July, I've got you covered! 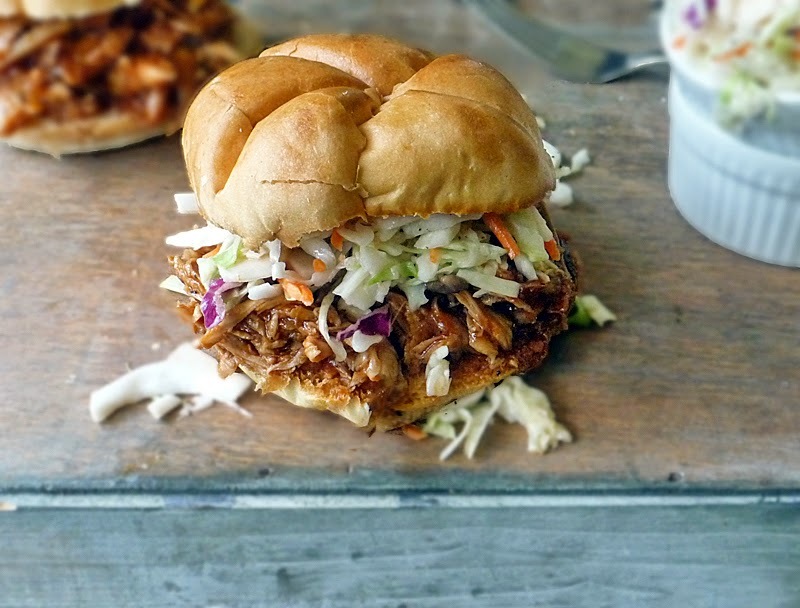 This Barbecue Pulled Chicken Sandwich will satisfy your barbecue cravings, and it's easy to make too! You make this indoors so you don't sweat in places you didn't know existed, and everyone will be amazed at your BBQ skills! 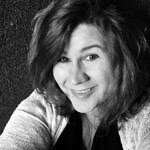 You may have heard of this little blog called The Pioneer Woman <wink> The Pioneer Woman is probably the first food blog I ever visited. I love reading Ree's posts. She's a hoot! She has a cooking show on TV too that I'd like to check out, but I've never seen it. WHAT? I know. Sad but true. We don't watch a ton of TV, so we only have an antennae and access to the big networks. It saves big $$$$ not having to pay a cable bill!! Anyway, the first recipe I made after scouring The Pioneer Woman's website was her Strawberry Shortcake Cake. Oh! My! Goodness! It was delicious! I made it for a friend's birthday, and she loved it!! I don't have a picture of the cake, but trust me, it was beautiful!! The cake was such a huge hit, I wanted to try more, so I signed up for the email newsletter. 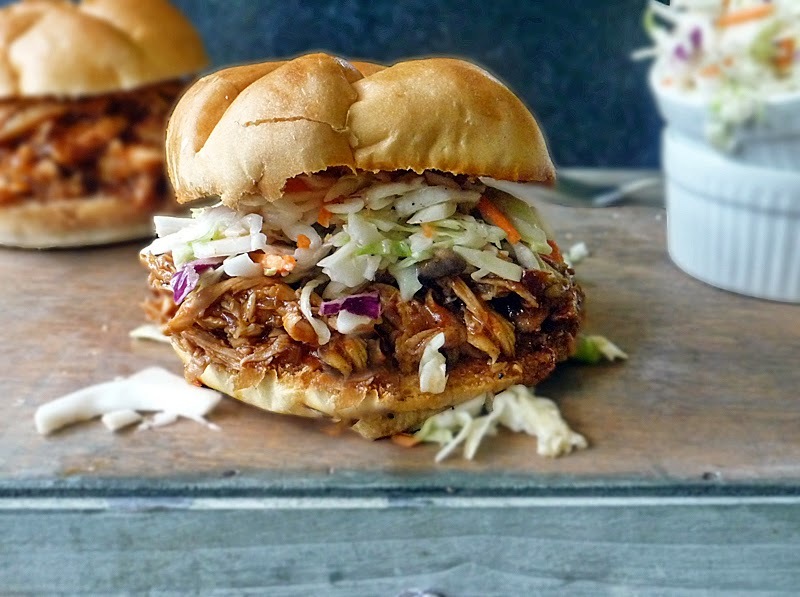 When this Barbecue Chicken Sandwich hit my mailbox, I knew that was the one! I had to try this recipe. It is loaded with garlic!! I may have mentioned once or twice about my love affair with garlic! I did change a few things in the recipe to suit our taste, so I'm sharing my version of The Pioneer Woman's delicious Barbecue Chicken Sandwich. Enjoy! Preheat oven to 300 degrees F. Season the chicken with salt and pepper. Heat a dutch oven over mid-high heat and add 2 tablespoons oil. Place the chicken in the pot, skin side down and let sear for 2-3 minutes until nicely browned. Don't move it around. You want it to get a nice sear. Flip the chicken over and sear on the other side letting it cook for 2-3 minutes to get that nice brown coating. Be careful the skin doesn't stick to the pan. If it seems to be sticking then it needs to sear some more. It will release when it is ready. If you can't fit all the chicken in the pot at once, that is okay. Keep searing until all the chicken is nicely browned. Remove chicken from pot and set aside. Drain off any excess grease, leaving about a tablespoon in the pot. Reduce the heat to medium and add the sliced onions and 8-10 whole garlic cloves to the pot. Cook, stirring, until the onions start to get tender. Place chicken back in the pot and add 1 large bottle of barbecue sauce. I used a 40 ounce bottle of Sweet Baby Ray's Sweet and Spicy sauce. I used most of the bottle. We really enjoy that sauce in this recipe. Place the lid on the pot and put the whole thing in the preheated oven for about 1 1/2 - 2 hours. Check on it after 1 1/2 hours. If the chicken is falling off the bone then it's ready. Remove the chicken from the pot and allow to cool a bit. When the chicken is cool enough to handle, remove the meat from the bones, shredding it as you go. You'll want to remove the excess fat from the liquid in the pot. The fat will rise to the top and you can just skim it off with a spoon. Return the chicken to the sauce and reheat as needed. Give it a taste and add salt and pepper if needed. 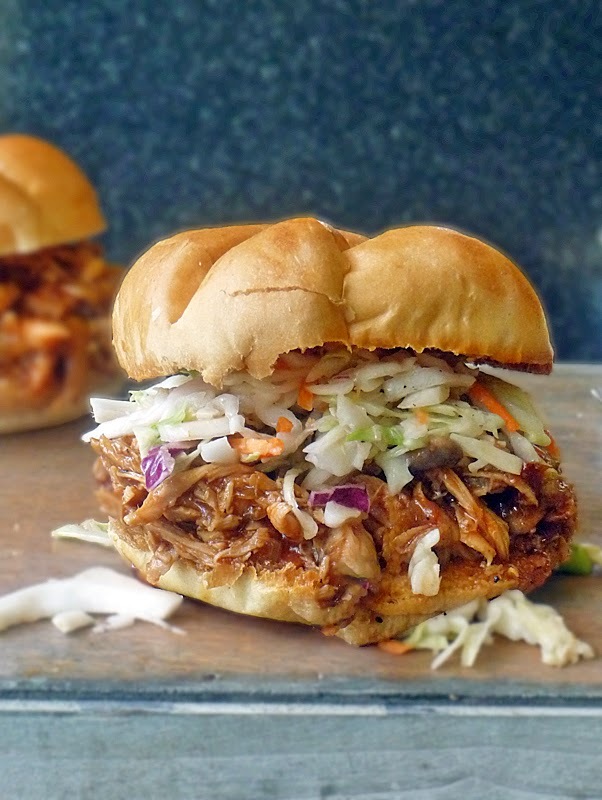 Serve on toasted Kaiser Rolls with a big heaping spoonful of The Best Coleslaw Ever and enjoy! Your sandwich looks yummy Marion! I would eat that for breakfast. ha ha. that's too funny, Shelby! I think I would too!! Looks absolutely wonderful! Beautiful pictures! yummy. this sounds awesome. Thank you for posting this up. going to give this a go.